After coming off of the covered entry, you enter a formal foyer with a stairway and then a formal dining room to the right. To the left there is a small hall that leads to a study or guest suite with a walk–in closet and a full bath. The full bath has a secondary door for direct access from the foyer. A pair of glazed doors leads to the rear terrace. This entire section of the house might work perfectly for an aging parent. A large opening in the foyer leads to a gathering room thatis open to the kitchen and the family dining area. A large fireplace is centered on the wall to your left, flanked by built–ins on either side. Windows and a pair of glazed doors look out to the rear terrace, which extends the living space. The kitchen has a raised eating counter that divides it from the dining area and the gathering space, and a center work island with a prep sink. A butler's vestibule with cabinets is a functional transitional space between the kitchen and dining room. From the informal dining area, a door opens into a four seasons room, which has screens on all three sides, and a fireplace in one corner to keep the room warm on cooler days and nights. From the kitchen, a rear hall leads to a walk–in pantry, a small home office, a powder room, and a three–car garage. The hall has room for a seat and built–ins/lockers, making it an ideal mudroom. At the top of the stairs to the second level there is a laundry room conveniently located next to the landing. A master suite takes up almost the entire left wing of the upper floor. The master bedroom has its own fireplace, and a sitting area with bay windows that look out to the rear. The luxurious master bath, which has a decorative tray ceiling, has two walk–in closets, a private toilet room, two separate vanity sinks, a whirlpool tub, and a separate shower. On the other side of the balcony a hallway leads to two more bedrooms that each have their own walk–in closets and full bathrooms. The bath next to Bedroom 2 can also be accessed from the bonus room above the garage. Due to licensing agreements, this home may not be built within a 50–mile radius of downtown Charlotte, North Carolina, without permission of the designer. The exterior of this handsome home is clad with brick and stone veneer, which is complemented with wood trim accents at the windows and details. 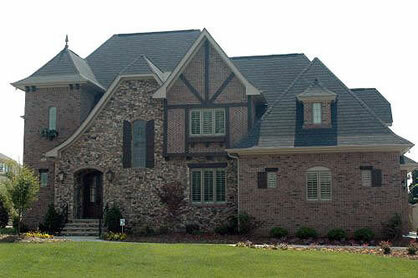 The many unique features of this home include a four seasons room with a gas fireplace at the rear, a pass–through butler's pantry between the kitchen and the formal dining room, a sitting area in the bay window of the master bedroom, and a large multi–purpose room over the three–car garage.